touristplacesinindia offers complete information on the city of Nainital, fast facts on Nainital, history of Nainital, best season to visit Nainital, climate and clothing in Nainital, Nainital hotels, places to see in Nainital, worth visiting places in Nainital, events and festivals of Nainital, accommodation options in Nainital, tourist attractions in Nainital, excursions form Nainital, hotels in Nainital, accessibility of Nainital, tour packages for Nainital, holiday offers for Nainital, how to reach Nainital through air, rail, road, luxury hotels and budget hotels in Nainital. The picturesque town of Nainital is located at the foothills of the Kumaon ranges of the outer Himalayas. This town still exudes the colonial charm which engrosses the tourists dropping in here from all parts of the country and also from abroad. The scenic beauty of Nainital is simply unrivalled and the most prominent landmark here is the Nainital Lake also known as Tri-Rishi-Sarovar. Nainital is one of the most popular summer retreats in northern India and offers ample scope for adventure and sightseeing to ardent travelers. Moreover, its cool and healthy climate makes traveling extremely comfortable, a factor that contributes towards the growth of tourism here. Nainital city in Uttarakhand offers many places of tourist interest to its visitors and to watch these attractions is a real delight. Naina Devi temple is among the major tourist attractions in Nainital and is a highly venerated place for the pilgrim travelers. 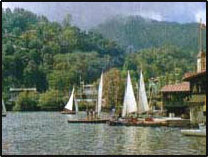 The lake area in Nainital is the place where all the prime attractions of the town are to be found. Whether you are a nature lover, a honeymooner, a family holidaymaker or a pilgrim, your trip to Nainital will definitely be a delightful experience. The Boat House Club is quite popular among the holidaying families and the honeymooners. A boat ride into the serene lake would surely be an unforgettable experience. Nainital is home to a large number of colonial buildings that were built here by the British as their residences and government buildings. There are many other things to watch in Nainital including The flats, Nainital Zoo, Eco Cave Gardens, Snow View, China Peak, Aurobindo Ashram, and Dorothy's Seat. Tourism in Nainital is ever increasing and so is the need for the lodging options to accommodate the tourists frequenting this amazing town. There are many categories of hotels that are available in Nainital such as heritage, deluxe, economy and budget. Some of the famous hotels of nainital are - Palace Belvedere, Royal Hotel, Shervani Hill Top Inn, The Naini Retreat, Vikram Vintage Inn, Hotel Everest, Mountain Trail, Swiss Hotel, The Pine Crest, Cedar Lodge, Elphinestone Hotel, Hotel Capri and Hotel Channi Raja. These hotels guarantee the best of facilities and services and your stay will certainly be a contented one. Nainital is also conveniently reachable since it is one of the major hill stations of north India. The nearest airport is in New Delhi, the airport at Phool Bagh ( 72 kms away ) being closed for public flights. The nearest railway station is Kathgodam Railway Station that connects the Delhi, Agra, Bareilly, and Lucknow. Nainital is also connected by a network of well maintained roads with all the major cities of the neighboring states. Know more about Nainital by clicking on to the site touristplacesinindia.com, which offers valuable travel information on Nainital.